Happy 420! So here we have a tiny little spoon. 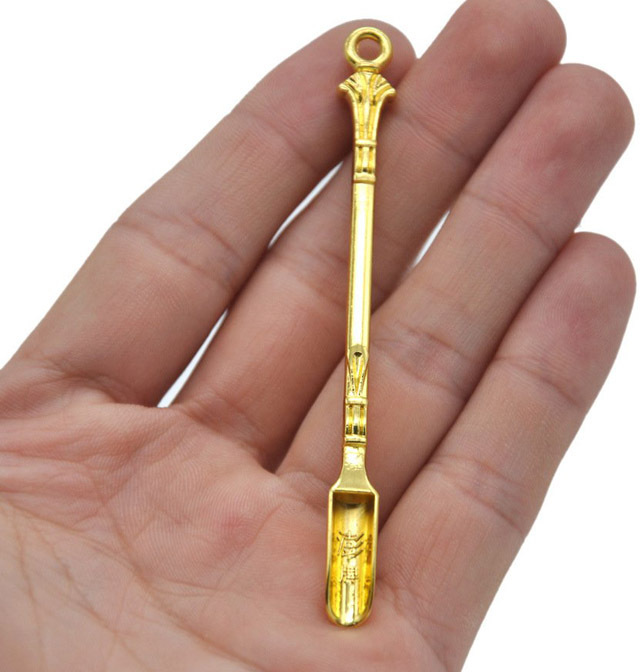 It’s called the Golden Smoke Shovel. It is about 85 mm or 3.35 inches in length. Isn’t this curious cutlery? It is described as being used for medicines, cigarettes, kitchens, etc. Or as a pipe shovel for smoking accessories. The best description by far is “Micro debugging spoon” because it would really help with my programming work. You get three of them. But what is it really to be used for? According to a wave of posts on Instagram, marble flatware is the rage this season. Marble cutlery has been around for a while and it’s usually a round handle of marbled plastic. 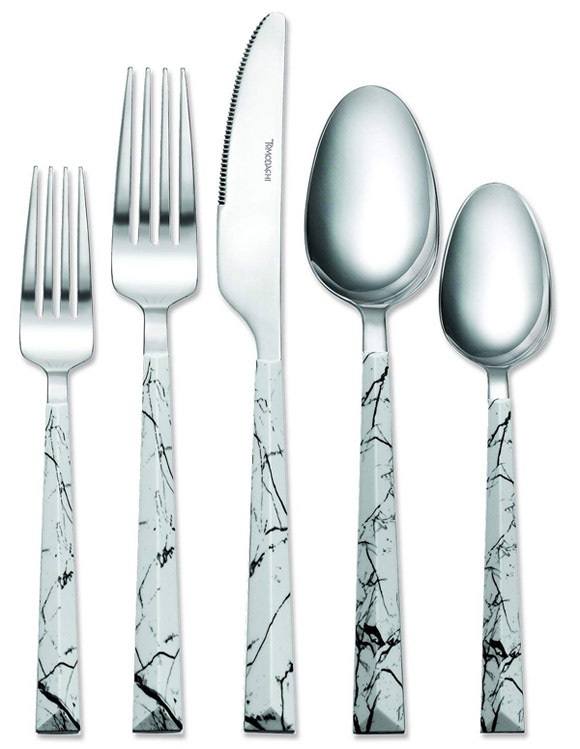 This Dali Marble cutlery from Tomodachi has little more flair and interesting design to it. The pyramid shape of the handles have make for easy handling and lay flat on the table. It is a 20 piece set which is service for four. This consists of 4 Dinner Knives, 4 Dinner Forks, 4 Dinner Spoons, 4 Salad Forks & 4 Teaspoons. It is made of 18/0 Stainless Steel but hand washing is recommended. I have a special place in my heart for enamelware. It reminds me of the smalls pots and coffee cups my Grandmother used on the farm. 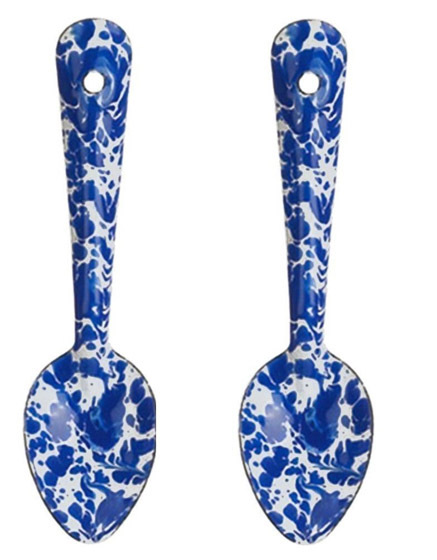 And the design of these enamelware serving spoons from Crow Canyon fit the bill. This flatware is a set of two 6-inch spoons that are oven, freezer and dishwasher safe. Two things to remember, they are metal inside so no microwave because cause they will spark (for that matter they might rust if you let them sit in water). And secondly that enamelware needs a little care, no smacking it around on pots and pans or it may chip. But that’s part of the down on the farm character. August 2016 saw ‘Pop goes the Weasel!’ – a large retrospective exhibition of Ann’s work – open at the Royal College of Art, Kensington, London. 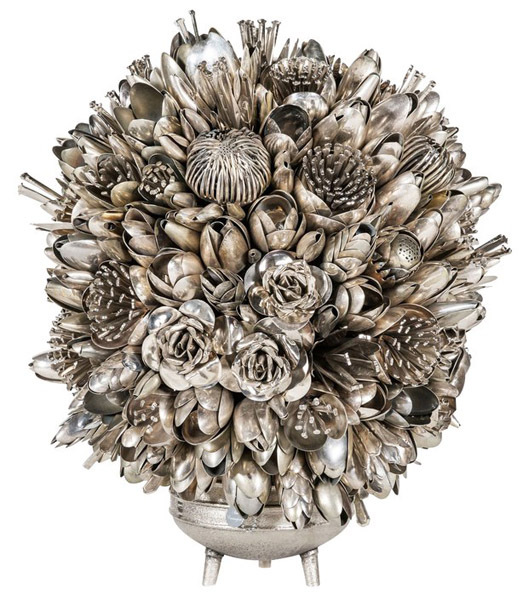 The centerpiece of the exhibition, Devil’s Trumpet, a floral sculpture fashioned from cutlery, was acquired by the V & A for their collection and will be on permanent display in the Silver Gallery from October 2016.